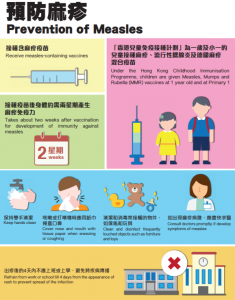 There is an upsurge of measles cases in Hong Kong in 2019 with the occurrence of an outbreak at the Hong Kong International Airport (HKIA) starting in March. With the addition of seven new cases Thursday, two being employees at HKIA, the total has grown to 50 cases, a number not seen in years. Of the 50 patients, 23 worked at the airport. This compares with the nine, four and 15 cases in the whole year of 2016, 2017 and 2018 respectively. According to all the seven new patients, they did not have contact with measles patients during the incubation period. Their home contacts have remained asymptomatic so far and have been put under medical surveillance. Upon confirmation of measles outbreak in March, the Department of Health has implemented control measures at the airport including vaccination and blood testing services. A total of 93 persons received measles vaccination at the vaccination stations Thurday, bringing the cumulative number of vaccinations given to 7,878. Globally, an increased number of measles cases were reported in many countries in 2018 and this surge continues through 2019. In view of the ongoing outbreak of measles in the Philippines, the Center for Health Protection advise foreign domestic helpers (FDHs) who are prepared to work in Hong Kong to receive measles-containing vaccine (e.g. MMR vaccine) before they come to Hong Kong. Filipinos who are working or living in Hong Kong and plan to travel to the Philippines are advised to follow the outbreak situation in the Philippines, and arrange to receive measles vaccination in the Philippines before coming back to Hong Kong.